Continuing on in my Darth Maul exploration project, following Darth Maul’s attempt at revenge on Obi-Wan Kenobi at the end of season four of Star Wars: The Clone Wars, it would have made sense for Darth Maul to go after Obi-Wan Kenobi, expecially since he was only barely able to survive, thanks to Asajj Ventress. However, apparently Maul and his brother wander around, as the opening narration states: “After rescuing his brother from despair, Savage and Maul murder and pillage at every turn. 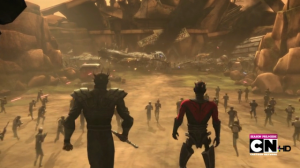 Fueled by rage and vengeance, they search for meaning in their new alliance, as reports of their brutal attacks spread across the galaxy.” As this last line is stated, we see them killing two Jedi…. 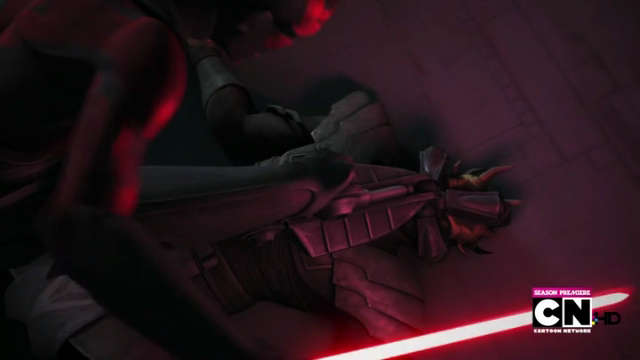 This interaction shows that Darth Maul is truly interested in Obi-Wan Kenobi’s death and not so much about being wealthy. Maul states that the Jedi are hunting for them, which is interesting, since that is not mentioned in the opening narration, nor do we have any other way of knowing that…. Also, it is interesting that he believes that they will be forced to make a stand…. 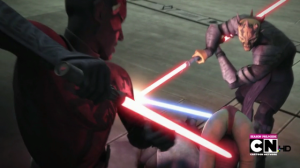 Savage Oppress clearly believes they should be on equal footing as brothers, however, Darth Maul believes he is the stronger and should be considered the master, to which Savage Oppress lights up his light saber. Darth Maul realizes that he needs to assert his dominance: “So, it is time for a lesson.” They then proceed to engage in a light saber battle until Darth Maul clearly overwhelms his brother. 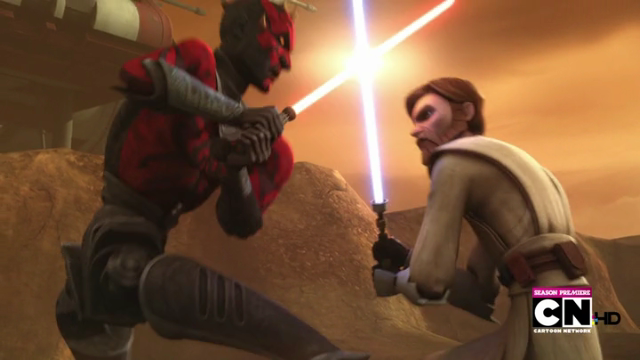 Savage Oppress is very surprised at how much Darth Maul has progressed (“You have grown so powerful!”). 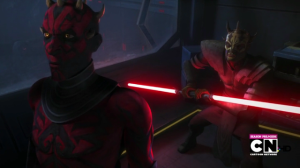 Darth Maul responds by saying, “And I shall complete your training – not as your brother, but as your master.” From this point forward, it is clear that Savage Oppress accepts his new position. They then travel to just outside of Florrum, where Darth Maul wrangles some of the pirates to become loyal to him (not much choice: either become really rich or die), and then tries to use them as leverage and and threatens Hondo Ohnaka to join him or die, who turns him down. Clearly, Darth Maul doesn’t understand Hondo’s psychology as an independent pirate. Darth Maul and Savage Oppress then head down to the planet with their new small army of pirates to try to defeat and take over the pirates. However, there is a snag to their plan: Obi-Wan Kenobi and Adi Gallia, having investigated the recent robbery, are able to track them down to Florrum. So, Obi-Wan Kenobi teams up with Hondo against the Sith brothers, to which Savage Oppress comments: “The Jedi, brother, they’ve found us.” And, in a really telling way, Darth Maul bemoans: “No, it’s too soon – my plan isn’t finished yet – too soon.” From this comment, it shows that Darth Maul is very early on in whatever his plan is and that he is simply not ready to take on the Jedi. 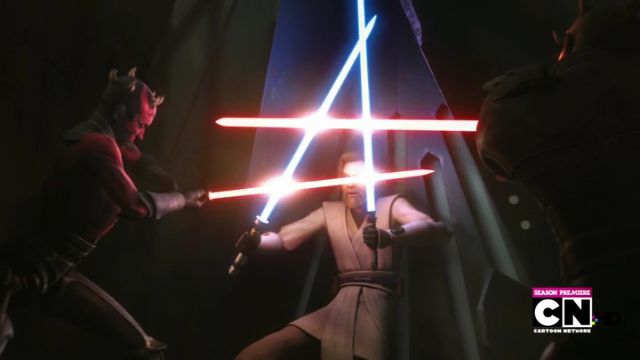 The four engage in a great light saber battle – mostly Darth Maul facing off against Obi-Wan Kenobi and Adi Gallia against Savage Oppress – until Savage Oppress kills Adi Gallia. 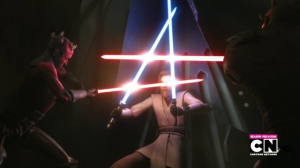 Obi-Wan Kenobi is able to use her light saber, wielding two at once! 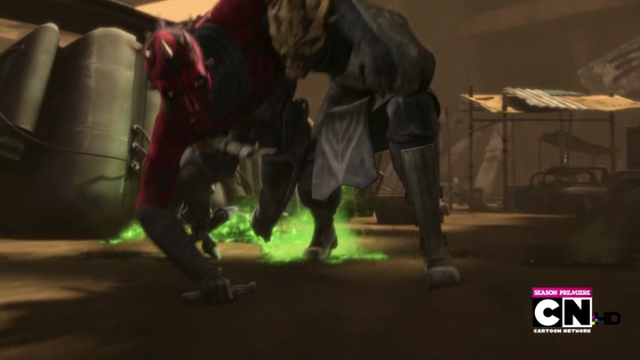 They all scamper into the caves and continue fighting, until Obi-Wan Kenobi slices Savage Oppress’ left arm off, Darth Maul Force pushes Kenobi away and crashes rocks down to intercede between them so he can tend to his brother and he acknowledges that the plan was a failure. They then run away with the pirates shooting at them (all of them now, since they have not paid attention to the pirates they had recruited and who had now rejoined their comrades) and Darth Maul’s left leg is shot at the knee and the below part of his prosthetic knee comes off, with Savage Oppress whisking him away. Smartly, while they are running away, Darth Maul uses the Force to send the Jedi ship crashing down. 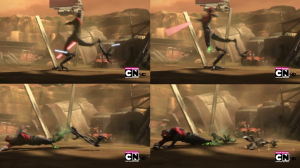 However, after lifting off, their ship gets hit with a bazooka shot and Darth Maul says for them to get to the escape pod – Savage Oppress, being very sad about their situation, says it’s too late, however, Darth Maul says “Trust me, apprentice” – so they are able to use the escape pod and get away, while the ship comes crashing back down on Florrum. They are then able to get away…. He is more interested in vengeance against Obi-Wan Kenobi than he is in amassing a fortune. He actually sees money as a means to defeating Kenobi. He believes that power and money are worthy enough motivations (as well as retaining one’s life), which he overestimates in dealing with Hondo Ohnaka. He did not estimate that his robbery might lead the Jedi to go after him, thus thwarting his plans. In dealing with the Jedi, he is not able to focus on the purpose of his visit – to build an army – and, thus, loses control over them…. He has a great amount of compassion for his brother, such that he is more focussed on tending to his injured brother than in finishing off Obi-Wan Kenobi. He loses part of his leg…. Lastly, he believes that they are able to make it out of the ship, even when his brother believes that it’s all over – he persuades him that it’s not.